With its novel vignettes and its use of a camera obscura in the production of the plates, William Cheselden’s Osteographia, is recognized as a landmark in the history of anatomical illustration. Monique Kornell looks at its unique blend of accuracy and elegance. 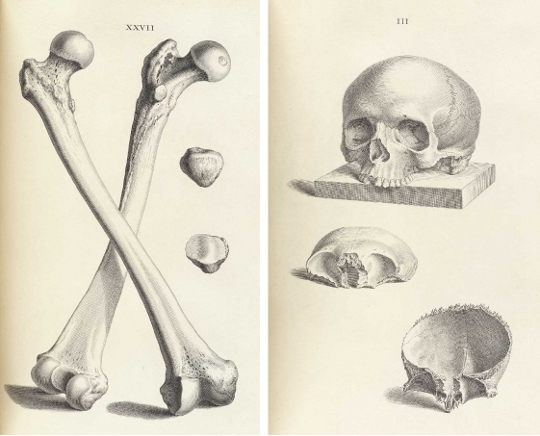 A lavishly illustrated and particularly elegant book of human and comparative osteology in large folio size, Osteographia, or the Anatomy of the Bones, was published in London in 1733 by William Cheselden (1688-1752). 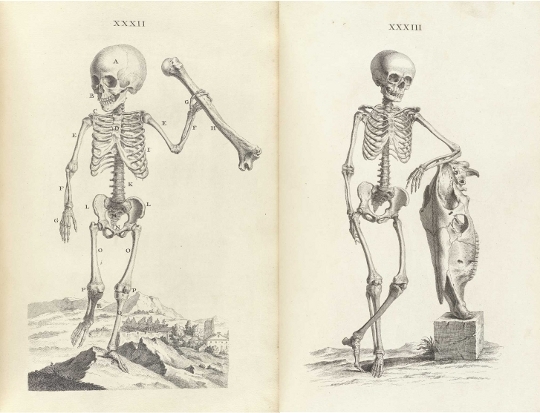 However highly it is esteemed today, it was a financial failure for its author, unlike his earlier, less expensive and more general work, The Anatomy of the Human Body (1713), which went through numerous editions. Cheselden, a successful surgeon based in London, first won fame for his perfection of the lateral method of lithotomy, or “cutting for the stone”. At the time of publication of the Osteographia, he was already well established in his career. Surgeon to Queen Caroline, to whom the book is dedicated, he was also a Fellow of the Royal Society, surgeon at St. Thomas’s hospital and the first foreign member of the newly founded Royal Academy of Surgery in Paris. if I had not been so much engaged about an Osteology in which every plate is twenty one inches long, and fifteen broad. All the bones will be done so large as the life, and the bones of the limbs and trunk, with sceletons as large as the plates will admit of; And besides these there will be some plates of the cartilages, ligaments and diseased bones; and every chapter will have a distinct head-piece and tail-piece, which will be chiefly made of the sceletons of different animals. The Osteographia eventually appeared in 1733 with a double set of plates, 56 lettered and 56 unlettered, “to shew them in their full beauty” (ch. 8). 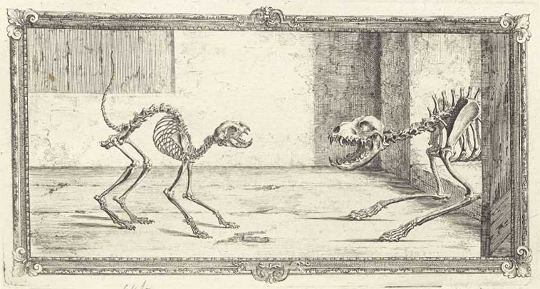 Part of the delay was that the initial drawings for the plates were abandoned when Cheselden, in his desire for the greatest accuracy in the rendering of the skeleton, had his artists, Gerard Vandergucht and Jacob Schijnvoet, employ a camera obscura, the use of which is illustrated in a vignette on the title page. As described in chapter VIII, the artist drew upon a roughened glass set six inches inside; a sliding lens allowed him to adjust the scale. The resulting image was then traced on to paper. Many of the preparatory drawings survive in the collection of the Royal Academy, London. In the production of the plates, Cheselden took a markedly active role. He chose the poses for the skeletons and oversaw each stage of the production, stepping in when necessary to correct both drawings and plates: “where particular parts needed to be more distinctly expressed on account of the anatomy, there I always directed; sometimes in the drawings with the pencil, and often with the needle upon the copper plate.” Cheselden was also attuned to the different effects that could be brought about in the engraving, and he comments that the use of unhatched, single lines to evoke the smoothness of the ends of the bones “was also my contriving”. Cheselden’s close involvement in making the plates and his desire for accuracy through mechanical means, as well as in the great expense incurred, parallel the contemporaneous efforts of the Dutch anatomist, Bernhard Siegfried Albinus, who had his artist, Jan Wandelaar, view anatomical preparations through a grid system of ropes. An early influence upon Cheselden’s attention to illustration was the surgeon and anatomist William Cowper, with whom Cheselden resided while studying anatomy. Cowper was also a remarkable draftsman and provided illustrations for his own works and those of others. Cheselden then attended the first St Martin’s Lane Academy of Art in 1720 and would himself later contribute accomplished plates for his addendum to the translation of Le Dran’s Operations in Surgery (London 1749). Much of the charm of the Osteographia lies with the vignettes of the animal skeletons, which are frequently depicted in lifelike poses. A cat with an arched back is startled by a dog; a young, antlered deer stops suddenly and turns to the viewer; a crane picks up a fish with its beak, yielding the conceit of a skeleton bird seeking nourishment from the bones of a fish. 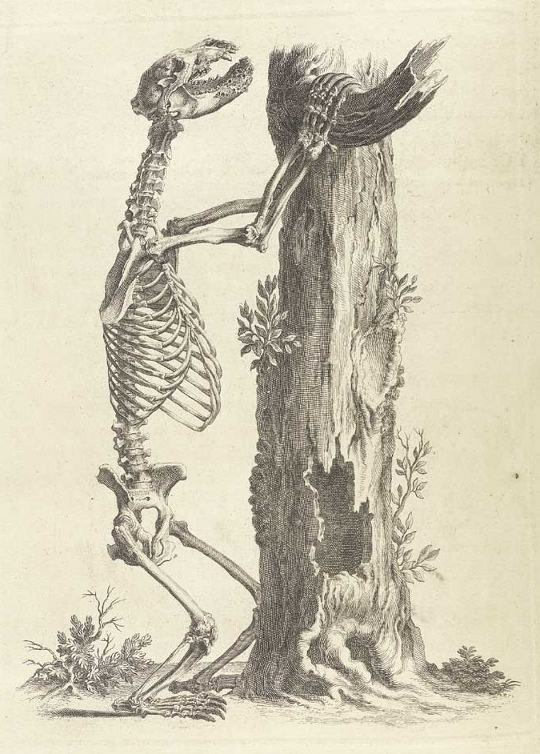 Cheselden’s comment concerning the skeleton of a bear indicates the care he took in the poses of the animal skeletons: “This skeleton being put together with stiff wires, I could not alter it into a properer posture” (ch. VIII). 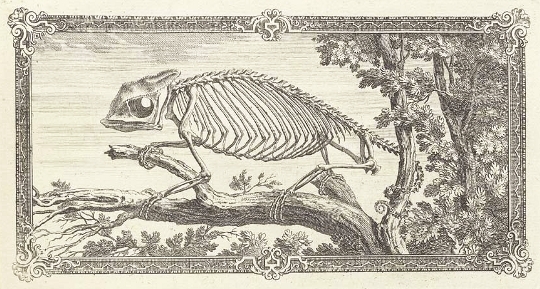 The pose of the chameleon skeleton, set on a branch with its tail wrapped around a twig, seen at the head of the fifth chapter, was adapted from an illustration first published by Charles Perrault in 1669. The inventiveness seen in the vignettes is likewise found in the decorated initials and the plates of entire human skeletons. 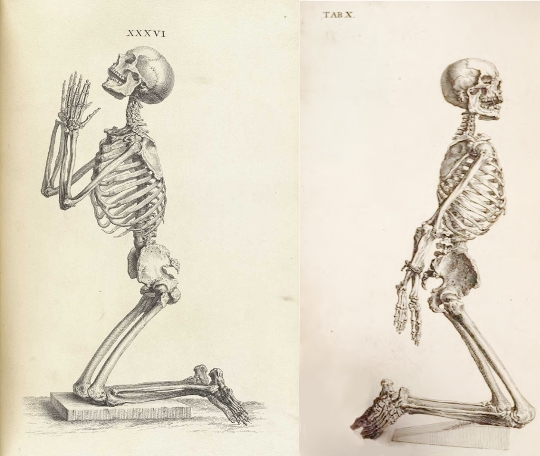 Inspired by the meditative skeletons of Vesalius, Cheselden offers a lateral view of a skeleton kneeling in prayer (Tab. XXXVI), the pose chosen in order “to represent the figure in a larger scale.” In the Anatomy of the Human Body of 1740, the figure has been adapted for Tab. X and is shown with his arms tied behind his back. The influence of Vesalius is also evident in the low-set Italianate landscape seen in some of the full-size skeleton plates, such as Tab. XXXII. Here the viewpoint manages to confer a monumental sense of scale to the skeleton of a year-and-a-half-old child, who is shown walking toward the viewer while brandishing an adult humerus. This bone serves as a comparison of scale but fails, nevertheless, to dwarf the skeleton in any way. The print that follows offers a comparison of scale and of species as well, as a skeleton of a boy of nine years is seen leaning against the skull of a horse, almost half his height. The frontal views of a male and a female skeletons are both after classical statues, the Apollo Belvedere and the Medici Venus. Cheselden has altered the pose of the latter, turning her head and placing her left arm out to the side rather than in the original “pudica” position, thus allowing for a better view of the pelvic bones. In addition to developmental plates of the bones, there are several excellent plates with cross-sections of the bones and depicting cartilages and ligaments. The seventh chapter and the last nine plates of the book are devoted to diseased bones, dealing with cases from Cheselden’s own practice and those of his colleagues. The preparation of the bones of the left arm, showing a congenital ankylosis of the elbow joint, which was sent to Cheselden by “Mr Goodwin” and survives today in the Hunterian Museum, London, is depicted in Tab. LXV, fig. 2. The fused “crooked skeleton” of Tab. XLIII is described as having been “dug out of a grave”. 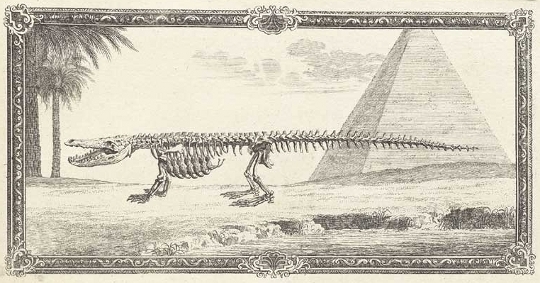 In the Osteographia as well as in his other works, Cheselden favored a reliance on the image for elucidation rather than lengthy description: “I thought it useless to make long descriptions, one view of such prints shewing more than the fullest and best description can possibly do” (Address to the Reader). For example, in discussing the intricate bones of the foot he concludes the fifth chapter by saying that “for what remains see the plate, which makes a farther description needless”. The brevity of the text is certainly one valid criticism of the many made by John Douglas, a rival lithotomist, in his querulous pamphlet, Animadversions on a late pompous book, intituled, Osteographia…by William Cheselden (London 1735). Curiously, his brother James Douglas, the anatomist and physician, was a valued friend and collaborator of Cheselden’s. From an advertisement in Cheselden’s Anatomy of 1740, we learn that only 97 of the 300 copies of the Osteographia printed had been sold. In an attempt to recoup his expenses, 83 of the remaining copies were cut apart so that the prints could be sold separately. In addition, 100 prints had been struck for a projected Latin or French edition. Some of these were used for an undated edition of the unlettered plates, issued without the text. The plates of the Osteographia are magnificent and worthy of their fame. 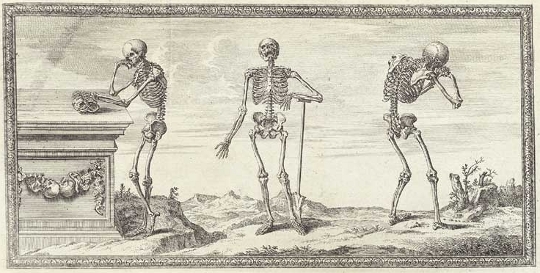 They are of a far finer quality than the crude depictions of skeletons, originally made for James Douglas, that appeared in Cheselden’s first edition of his Anatomy of 1713. Cheselden’s original plan, laid out in To the Reader, was for a three-volume work on human anatomy, all similarly decorated with plates of comparative anatomy. It is regrettable that the Osteographia did not meet with the financial success necessary to allow the completion of the project. Monique Kornell (Ph.D. Warburg Institute) is an independent scholar of anatomical illustration and of the study of anatomy by artists. She has written on works from the 16th to the 19th centuries and has previously published on Cheselden’s Osteographia in the catalogue to the exhibition she co-curated, The Ingenious Machine of Nature: Four Centuries of Art and Anatomy, National Gallery of Canada, Ottawa, 1996, pp. 190-193. Explore our selection of fine art prints, all custom made to the highest standards and shipped to your door. "One of our favourite journals." "Magnificent ... A model of digital curation"